We continue our look at some Christmas movies that for one reason or another are considered seasonal classics, regardless of age. This week, The Polar Express. Based on the 1985 children’s book The Polar Express by Chris Van Allsberg, the animated film version of the same name by Robert Zemeckis has already become a perennial favorite for the month of December and can now be safely described as a bona-fide Christmas classic. 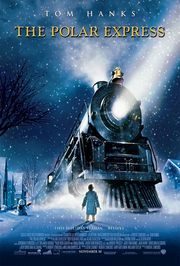 Released in 2004, The Polar Express was the first feature-length film to be released at the same time in a 3-D film presentation on the giant IMAX screen. The plot is an expanded version of the original book. Writer/director Zemeckis turned the simple journey to the top of the world into a white-knuckle thrill ride full of last minute rescues and edge-of-your-seat excitement. Trivia buffs may also enjoy some of the in-house references Zemeckis wrote into the script. In a news photo showing several Santa’s on strike, the placards they carry say they’re picketing the Lone Pine Mall. This was the same fictional mall used by Zemeckis in his 1985 hit Back To The Future. The house mentioned by the train’s conductor, voiced by Tom Hanks, is 11344 Edbrooke. This is the real street address of Zemeckis’ childhood home in the Roseland area of Chicago. And a scene in the elves’ North Pole communications room shows an elf talking about a young boy who may have to go on Santa’s naughty list. The boy’s name is Steven in New Jersey who has terrorized his two sisters. This is a reference to Steven Spielberg who grew up in New Jersey and has admitted he would often terrorize his two sisters.